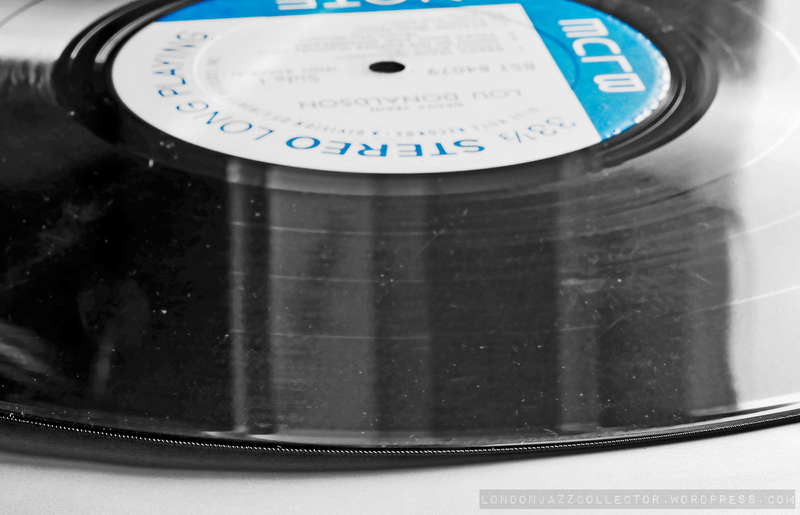 The very earliest 12″ microgroove Blue Note LPs (1956/7) were pressed without the slightly raised profile to the edge of the central label area – called a “groove guard” – which is found on all later pressings. The first pressings of BNLP 1500-1557 all have a flat profile, and none after. The flat edge also refers to the finish of the outer edge of the vinyl, a trimming process by which excess vinyl extruding from the stampers is cut off immediately after pressing . As seen on this copy of BN 1530, the vinyl rim was trimmed at 90 degrees, a straight vertical cut, leaving a “flat edge” the thickness of the vinyl, though lightly chamfered at the top and bottom edges so as not to leave sharp corners. 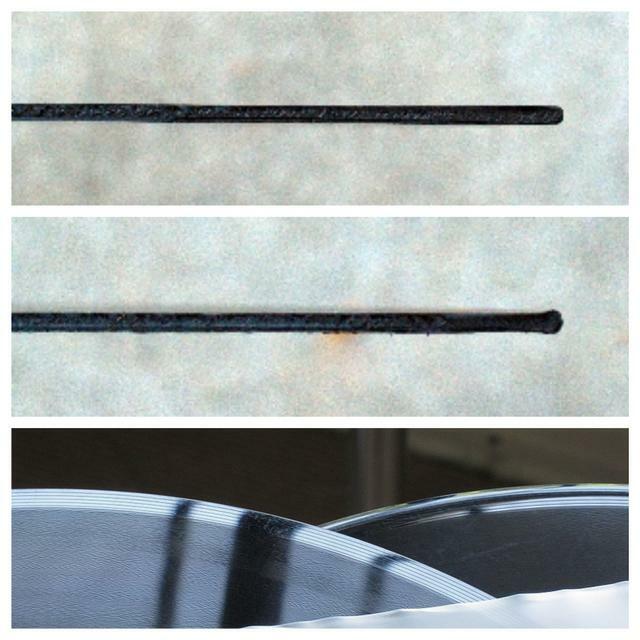 Flat edge was succeeded by “beaded rim” as found on most records today and in the following fifty years, where the edge of the vinyl is trimmed to a smooth rounded edge, the profile like the letter “D”. The waste vinyl left after trimming is contentious, as some plants added this waste vinyl back in the pressing of future records, adulterating pure vinyl to reduce cost. The significance of serrated edge is close to zero, however it is not “negative”. This pressing was pressed from an original Van Gelder Stereo master. I have five Division of Liberty pressings with serrated edge out of about fifty Liberty reissues. Uncommon, but not rare. Since Liberty had records pressed at at least two locations and eventually at multiple locations, copies of the same title will be found with and without serrated edge. Hi. I’m trying to find pix of the flat outer edge of old blue notes. I found this thread on here, however the link that was provided was from 2013 and the blog with the pix no longer exists. Is there anyone that might have said pix, vs. the raised groove guard? I’m trying to determine if a copy of Kenny Burrell vol. 2 i just picked up has the true flat edge. Thank you for any help in advance! Here ya go. Flat is on the left, beaded on the right. Any way you can post those pictures again? Thanks! Sir, are you the one who wrote Jazz In The Movies? If you mean me, LJC, no, I have no published works. Oh… slight misunderstanding here. I was asking David Meeker. I was just playing my lou Donaldson blue note 4271 ‘Mr shing a Ling’ and noticed it has a serrated edge. I believe this is my only blue note that has this feature. Helpful, if only to confirm this is an outlier plant used occasionally by Liberty which had this trademark finish. They don’t sound any different, so I think its an anomaly but of no account. UPDATE March, 2018 – Keel Mfg. Hauppage Long Island seem to be the main suspect, records dating from 1968 found to have the self-same serrated edge, with Keel credited on the sleeve. Possibly ABC used Keel? I have a strong speculation that the serrated edge is an indication it was pressed by ABC as I recently came across a large stash of early ’60s ABC records and every one had the serrated edge. In my limited experience with duplicate pressings where one had a serrated edge and one didn’t (two Blue Notes and one Impulse with identical deadwax etchings), the one with serrated edge had a clearer top end and was on quieter vinyl. Obviously this has nothing to do with the edge, more likely than not they were just pressed with a fresher stamper but I did find the consistency interesting. this Baronet Parker record was the first LP I owned. My parents gave it to me on my 14th birthday in 1962. (I still own it) I played it a zillion times, and with 4 boys from the neighbourhood we changed our dixieland band into a modern jazz band. This was the only record we had. We played nearly all the quintet song of this Baronet. Life was good, and as far as i knew, all records had serrated eges. Although, checking it right now, I see that about a quarter of the record is not so very much serrated but more raised edge. That is an awesome story, sorry I just saw it and am replying right now. My introduction to jazz also came through Charlie Parker – I’m a bit younger so it was “Diz n Bird” on a casette tape. Still remembered listening to that one over and over again though. Eventually scored it after getting a record player two years ago on the Royal Roost label. Such a great recording, even if the sound quality has much to be desired. Thank you for the info on the serrated edge liberty pressings. I have 10 Liberty pressings and 3 of them have the serrated edge. Somethin’ Else, Miles Davis Vol 2 and Mosaic By Art Blakey. Ive noticed that the vinyl on these seem to be of better quality as well, maybe slightly heavier. I actually think it gives the records a nice touch. I just wish i could find more of them. Just received a Div of Liberty Hank Mobley “Hi Voltage” that has a serrated edge to it. Definitely does seem to be a bit heavier than other Div of Liberty pressings I have. Looking forward to comparing sound quality on it, would be nice to someday nail down which plant pressed these, not that it would help w/ finding these LPs online since I don’t think I’ve ever one seen an Ebay seller describe the serrated edge in their listing…..
Well I’ve learned something today. I have read people referring to “Gruve-guard” and “raised lip” and “raised edge”, so I assumed “flat edge” was something else. Haven’t seen “flat edge” photographed before. Power of the picture to communicate much more than the word.